Great news for Sage 300 ERP Online users! Sage will be introducing live chat for connectivity support. This chat feature will connect you with a live analyst and will be accessible from Sage logon page. Mark your calendar, the new service is going live on June, 27, 2012. 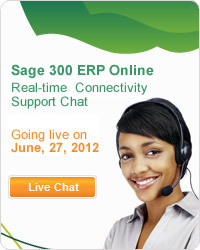 Once the service is live you will find a "Connectivity Support Chat" button on the Sage logon page. In addition to connectivity support, requests for additional ERP Users, RCALs, or databases may also be made through the chat. Users should also be prepared to provide the support analyst with the Citrix User ID and Sage Customer ID. For more information concerning this please contact Sage at support.300erponline@sage.com.